When we decided to spend the first years of our retirement in Spain, our biggest worry was how to get all five of our pets from the U.S. to Valencia safely. Our big day, the day we left to actually begin retired life in Spain, the day we researched and planned and dreamed about for months and months, was probably my worst travel day ever. And I’ve been detained in the middle of the night by Saudi security at the Jeddah airport on a business trip from Kenya to Pakistan because I had a can of beer in my carry on luggage. 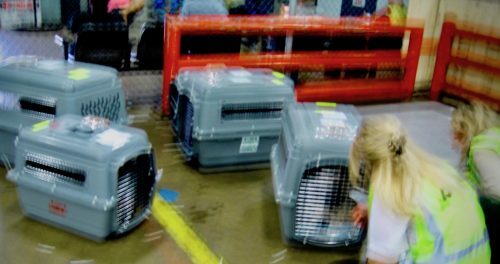 On that day our first enlightening experience was at the American Airlines air cargo warehouse in Chicago — one of the least pet-friendly places you and your pets are likely to encounter. Despite the fact that we had a reservation and an air waybill confirmation number for Lizzie and the cats. They weren’t expecting us. Had no idea we were coming. No one really knew what to do with us, so they said, “Sit over there.” So we sat. And waited and fidgeted. What breed is this one? We were fish out of water in the hubbub of forklifts and crashing gates, trucks and truckers. We didn’t have a clue what was going on. And we were intimidated. Eventually, we got more paperwork to fill out. Have they been tranquilized? Fed? Watered? No, yes and yes. And that was fine. One gate passed. Then someone took a look at the pet health certificates and a whole new kerfuffle arose. They were very concerned about the cats’ breeds and didn’t understand that the standard designations DSH (domestic short hair) and DMH (domestic medium hair) are actually breed names, even though the designations were used on the USDA-approved paperwork we presented. I don’t know how many times or how many different people peered into the cat’s kennels with their forbidden breed cheat sheet trying to guess if any of our cats was a Persian, Burmese, Himalayan, or Exotic Shorthair. That added about an hour to the process. Eventually everyone was satisfied and we paid the more than $4,000 tariff and reluctantly waved hasta luego to those little faces peering out of the kennel doors. What a relief when we learned our pets had been loaded onto the plane. A couple hours later we were relieved to learn from the gate agent that our pets had been loaded on the plane. Nine or so hours later our friend Jenny met us outside the arrivals terminal in Barcelona, and we rented a very expensive much too small van. Driving around and around (but only twice) we found the cargo warehouse. I grabbed the paperwork and confidently strode in to claim my live animal shipment and bust everyone out. Not so fast. With a line of unhappy truck drivers and one window open, we began the inauspicious beginning of our six-hour long process to clear the customs paperwork. A mistake had been made but it wasn’t our fault. The USDA APHIS office in Madison advised us incorrectly about how to report microchip and rabies vaccination dates on Lizzie’s paperwork and it took that long to get to the correct person in the US who could write the official email to the effect that Lizzie was cool. (I recommend you master the EU Pet Health Certificate Process yourself to avoid a similar fate. During the waiting, I did get to see, water, and feed everyone when I went into the animal holding room, separate from the main cargo warehouse, with the Spanish veterinarian who needed to clear their health certificates. Then we needed a stamp from another office in another building so off we sped back to Terminal 2 at the airport. With no place to park, I jumped out and scurried into the building, and— it was being renovated. No one around, no signs, a bit nightmare-like. That same nightmare where I wander around lost in the airport, never getting any closer. He smiles at me and then he walks off (to the of tune some really ominous music playing in my head). I wait. And then, just as I’m on the brink of hopelessness he’s back. I’m led through a series of empty offices complete with flickering florescent tubes, falling ceiling tiles, dangling wires – I am not exaggerating here- it felt like a strange Pakistani movie set- and there all by himself was another young man with what I suspect, was nothing to do. Would he find something else wrong? 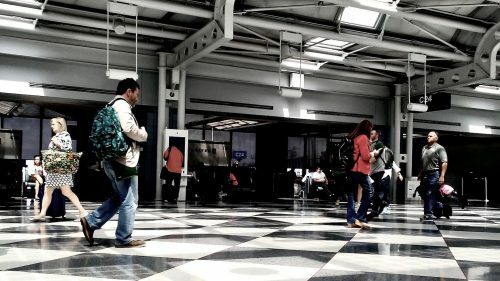 Will I have to return to my lost in the airport ordeal? No he doesn’t find anything wrong but I will spend another half hour listening to a lonely young Valenciano, recently posted to Barcelona. The whole time I smile and nod and keep my eye on the stamp he’s holding in his hand as he waxes eloquently about his home city and his little dog named Túria. Just stamp the damn document, I want to say. Eventually he does. And I’m on my way. But wait. Where are Jenny and Susan? Where’s the van? Sure enough, the airport police shagged them from the no parking zone. As I look around, Jenny appears and we’re off. 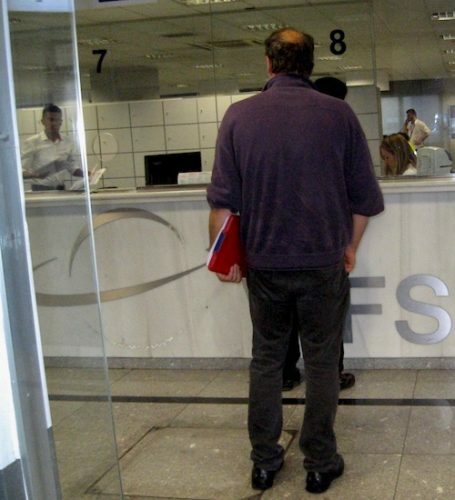 Back to the customs warehouse, where I present the release documents, signed and sealed. 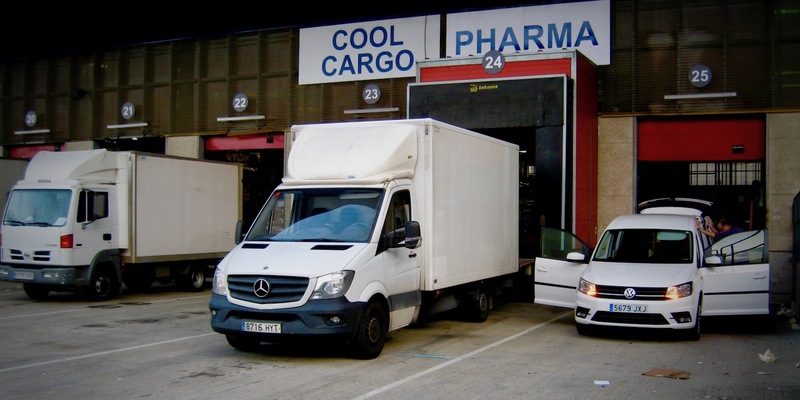 But there’s the €91 handling fee and another hour of waiting at loading dock Number 25 before we are finally a reunited family embarking on the final leg of our journey from Barcelona to Valencia by van. We’ve been adjusting to life in Valencia for nearly three months now. I’m happy to say that none of our pets were permanently traumatized by their international journey. The one that I stressed and worried over. In fact, I’m certain each one of them is happier here than they were back in Salem. The cats have much more time in the sun and Lizzie meets dozens of dogs during her many long walks. Have you found a vet that you love in VLC that speaks enough English to make sure that you know what is going on? My husband is supposed to be bringing our 2 pups back to VLC with him in early September, though I am concerned about whether KLM will actually allow them to fly given how hot it is now. Anyway, we are in City center, near PdlVirgen, and would love a recommendation. We have tried a couple different vets in Valencia and settled on Clínica Veterinaria Calabazas, C/Calabazas 12, very near the Central Market. Neither of the two veterinarians speak English. Although we love Agueda’s over the top efforts to be understood. Inmaculada is a little more difficult to understand. But, their intense dedication to our pets’ health makes a little language difficulty worth it. Several of our friends also swear by this clinic. And Lizzie happily walks through the door. Early on we used Google Translate, but our language skills are much improved so we don’t need it anymore. No appointments, just show up during office hours Monday to Friday 1030 to 1330 and 1700 to 2000 and Saturday 1100 to 1300. Lizzie and the kitties came in on an early morning flight on September 12 and the weather was fine for it. I hope your pups have smooth sailing. How in the world did you get a place here with so many pets? My husband recently retired from UCSD and we’ve been in Valencia for close to 90 days with our little dog named Lele. We ended up forking out more for an Airbnb because I could not find any pet friendly month-to-month pisos. It doesn’t surprise me that short-term rentals in Valencia aren’t pet friendly. We spent quite a lot of time patiently searching for an unfurnished flat with our pets. Susan and I would be happy to share a evening drink with you and Alan. Check your email. Wait, it costs $4,000 to bring 5 pets? Wow. And another question- our two kitties LOVE snuggling together. It’s adorable. Could we send them in a shared kennel? Or would they think we were trying to get a two-fer deal? The cats would be miserable alone for so long. If we knew then what we know now, we could have managed getting our pets over to Spain without so much cost or trouble. We were worried about long flight times and hot weather, so we wanted a non-stop flight. And five pets at once meant we had to send at least one as cargo. One reason we wrote this post was to help others avoid the pitfalls we blindly stepped into. If you have two cats, they can fly with one human traveler as “checked baggage” for a few hundred dollars. You’ll have to check with the different airlines about conditions and whether they’ll even take animals on a particular flight. KLM and Lufthansa have good reputations. Most U.S. airlines, unfortunately do not. It is certain, however, that animals over the age of 6 months have to be kenneled separately. So your kitties will be miserable alone instead of being miserable together. But cheer up. After 16 and 17 years in the same home our cats have adapted remarkably well to being taken to new homes first across the U.S., then across the Atlantic and just yesterday across town all in less than a year. After only a few hours, they have each selected their window and new favorite lounging space. Lizzie, on the other hand, prefers routine and will need a week or so to realize she’s much closer to her favorite park.